Since I just started to learn how to dry brush - needed something to practice a bit more on. I played "Mad Max" a few months ago and was playing "Skyrim" at the time, so it wasn't a hard pick. Plus I wanted to test the strength of plywood on some thinner longer parts (dragon's tail). Stenciled the dragon upside down to minimize plywood waste. Both were pretty easy cuts. Thickened the dragon's neck and tail a little bit to give plywood more strength without ruining the look, however. 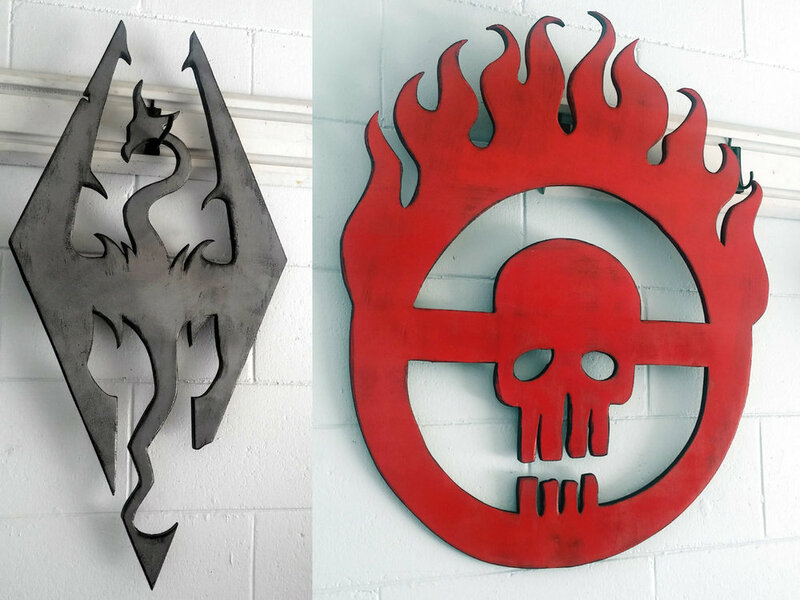 Something looked off about the Skyrim logo - the right wing wasn't broken at the bottom! Once both were spray painted dark silver and red, I dry brushed them black. If too much paint went on - I wiped the excess off (later I learned to thin the paint with a little water - makes clean up a bit easier). Dragon was quite easy overall. With the Mad Max piece - I learned not to mix vertical and horizontal dry brushing over flat surfaces (it's okay on edges since that doesn't matter). Had to and wipe off and re-spray quite a bit, but overall a solid learning experience. P.S. No arrows were taken to the knee in the process of making these.